In a recent article I evaluated the feature sets of tiny line mixers, in order to find one suitable for DEM (Desktop Electronic Music). It was difficult to find a perfect tool for the current ecosystem of small synths, drum machines, tablets, phones, and other consumer devices. For example, of the ten units considered, only three worked with stereo minijacks, since they targetted an earlier music-making paradigm. In this article I'd like to add some further functionality to my specification, and propose a mixer design. There's a real gap in the market for a compact mixer than can be used as a creative tool in its own right. I'd like to start the discussion with the Bastl Dude. Bastl is an innovative company who create pocket instruments and modular synthesisers. As such they exemplify what I am calling DEM, since this is a way of making music that relies on a multiplicity of interconnected devices. Dude is a simple mixer, but in the manual they have sections for "Dude as a sound processor" and "Dude as a tone generator". These possibilities exist with any mixer, but are highlighted here due to Bastl's outlook. Given this approach, it surprises me that the unit is not better designed for this purpose. As I mentioned last time, it's a monophonic unit with very basic controls. 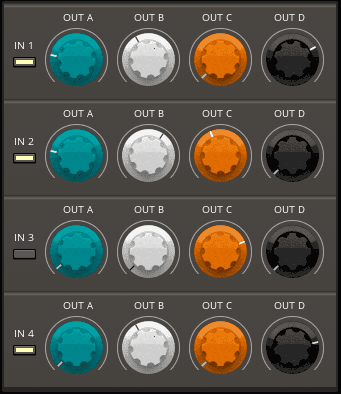 Bastl write about creating feedback loops, which is easily done by attaching outputs back to inputs. Elsewhere I have discussed the creative use of the "no-source" mixer at some length. See my website for a link to a full paper you might find intriguing. The other creative possibility is to use a mixer to feed different effects units. Full mixers have dedicated signal paths for this task, usually termed an auxiliary bus. But, rather than an afterthought, what if we designed a mixer to optimise this potential? First, we'd need to be working with stereo signals on minijack, since that is the DEM "standard". Next we'd need multiple outputs, and a way of addressing these for each input. The unit should be as compact as possible. There's no room here for additional features that are better supplied by additional devices, made for purpose. I'd also like to directly support high impedance inputs from contact mics, since these are very handy as drum contacts, sample triggers, or, yes, even audio microphones. As a bonus, we could input pickups from guitars and other instruments, home-made coils to pick up electromagnetic signals, and so on. All are part of my sound-making toolkit. These features rule out a passive mixer. Instead, the unit should run on a standard 5V USB input. We can supply this from an AC adapter, laptop, or battery pack. Lots of flexibility! How many controls can we support? Typically a mixer channel might have a volume potentiometer (fader), pan or balance control, and EQ, in addition to the sends. The following is a front-panel design that incorporates flexible routing. There are three channel strips, each mapping an input to three outputs. Each input has a power/mute button and gain knob. Underneath is a high-pass and low-pass filter. For each output channel there is a larger gain knob and a smaller balance pot. Minijack inputs would be provided on one side of the box, each with a switch to put it into high impedance mode. If there was room, full jack inputs could be normalled to these, like on the Rolls unit I discussed last time. This saves on using adapters and simply makes the unit more flexible. On the opposite side of the box would be the three output sockets, and on the back the USB power socket. I am guessing that the panel would be about half the size of a Korg Volca (approx. 8 by 12 cm). A smaller design is possible by omitting the balance and filter controls. The assumption here is that such signal processing occurs either before or after the mixer. This allows a unit about half the area. It would also reduce costs. Better yet is to assume that the output level will be set by whatever device is feeding the mixer. Here we have the smallest design, which is saves 60% of the surface area over the largest unit. Of course this depends on the size of the knobs and their separation. The other matter up for discussion is how many channels to support. The required space scales up rapidly, since both rows and columns must be added. For me, a three-by-three mixer is a perfect size if the feature set is maximal. You can always use more than one, in different places in your signal chain. This conforms to the DEM paradigm of flexibility and modularity. And don't forget that this is a stereo mixer. Each channel can be seen as a pair of ganged mono signals, if required. Nonetheless, if we are using only the minimum controls, a four-by-four matrix would look like this. The area is 10% less than the original maximal design, but is twice as large than the equivalent three-by-three configuration. 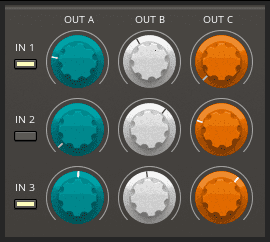 I would love a small mixer like this, to make it easy to connect up contact mics with drum machines with whatever, feed effects loops, and play around with feedback systems. I welcome discussion, comments and suggestions. And, oh yes, if you want to build me a prototype, we can talk about collaborating. Bring on the DEM Matrix Mixer! I'm curious why you want more than one stereo output. I only use a single speaker for my electronic music, although I do see why some people would want stereo. I'm confused how your proposed mixer would function. If you have a stereo input, what does the pan control do? If you turn the pan full right, does that put L+R on the right, or does it put only R on the right? You might want to look at the Mackie ProDx mixers. They don't meet your specifications, but they have some interesting features. They use a cell phone or tablet for the mixing interface, including reverb and EQ. You can also stream bluetooth to the mixer, which would be handy for phone based synths. The one with 8 inputs could be configured for three stereo inputs (the other two are bluetooth). The entire purpose of a mixer such as this is creativity. 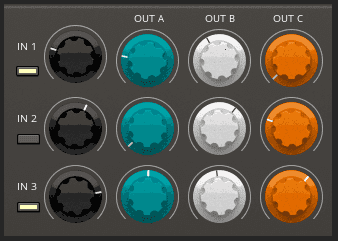 Multiple outputs allow you to send sound to different places, and even route it back to a an input. Stereo is used as a standard, because it gives more options. The control is not for panorama, it is for balance. This allows you to take a stereo signal and alter its proportion from left to right. Most of these designs drop the balance knob, since it is not core to the functioning. I am uninterested in a mixer than needs a computer to work (even a small computer like a tablet). My sound card is already a very capable matrix mixer, should I wish to haul around more gear. i had exact the same thoughts for the mixer. 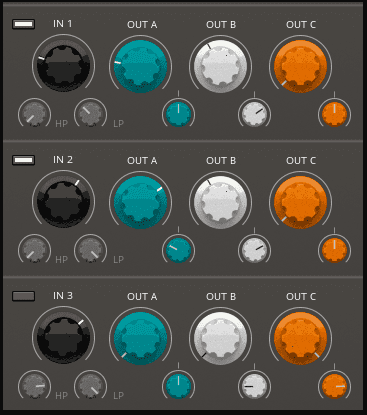 and i´ll try to build one but, as i use the volca series i don´t want a usb powered one, it should be passive.